The chat below shows the details of the Baby Boomers rush to embrace social networks. In the last week at least three people have told me of a parent that has 'discoverd Facebook'. It's no longer the case that you can just have a web site and sit back to be found. The web is maturing and big business. 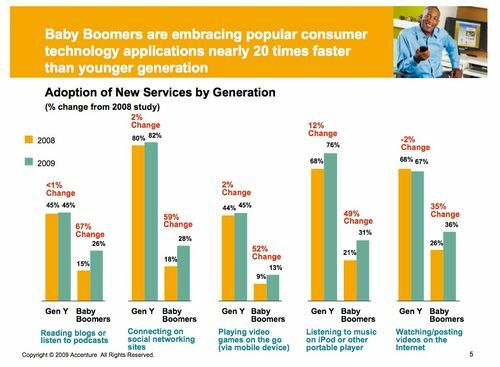 The rush of Baby Boomers to embrace Facbook, Twitter and social networking in general is indicative of this move. Additional data from the latest Accenture report is summarized here from TWICE. For medical spas, plastic surgeons and dermatologist, this represents a change in the way you'll need search engine marketing in order to get in front of your potential patient population. Yellow pages, newspaper... gone. Search, blogs, social networks allow you to harness technology and get it in front of your potential patinets; woment 35-60.